KINGLAKE, Australia (CNN) -- Police were questioning a man taken into custody Friday in connection with one of the many wildfires that have laid waste to parts of southeastern Australia. No other details were immediately available. 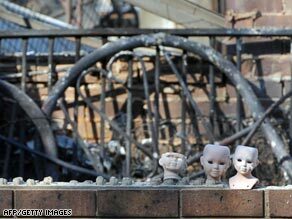 Porcelain dolls sit in front of a burnt house in the township of Phesant Creek, 100km north of Melbourne. The development came as the blazes that have roared through the region for nearly a week were slowly coming under control. The Country Fire Authority said the number of fires burning had dropped to 21 from about 35 on Thursday. While "the threat will remain for weeks to come," a spokesman said no towns were under threat Friday morning and that good weather had allowed firefighters to build containment lines around the fires. Meanwhile, more than 150 detectives were working on an arson investigation, authorities said. Two men who were arrested for "suspicious behavior" on Thursday were released without charges. "We are satisfied with their explanation and don't expect to talk to them again," Victoria state police inspector Peter Sheppard said. Sheppard said the tally is not being updated as frequently because it's become harder to verify fatalities from the fires -- which have destroyed more than 1,800 homes and displaced about 7,000 people. On Thursday, Prime Minister Kevin Rudd announced to parliament that the government will hold a memorial service and national day of mourning for victims of the fires. He said the government is working with the nation's Council of Churches to determine the day. CNN's John Vause contributed to this report.